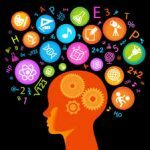 Historically, most psychology research has been about studying what is wrong with us; what makes us ‘abnormal’. Positive Psychology focuses on what makes people be more than just free of ‘abnormalities’ but to actually thrive. This is an exciting area of psychology. The founder is Martin Seligman. His research was based on many different, religions, cultures and philosophies throughout history and around the world. He discovered many commonalities. 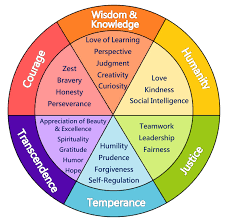 From this he found six core Virtues and from these we find twenty four character strengths that have been shown to help us thrive and be the best people we can. When we use our strengths, we can achieve more and enjoy a greater sense of wellbeing. Rather than taking a Pollyanna view of life, Positive Psychology acknowledges that individuals and teams may have very serious difficulties. To overcome these difficulties utilising our character strengths can be a way of bringing about sustained and workable change as quickly as possible. Working with character strengths can help both individuals and teams both overcome difficulties and achieve aspirations. The VIA questionnaire is a good place to start. There is both an adult and child version. You will need to register on the site to access the questionnaire by clicking here. It takes around 20-25 minutes to complete and get your summary report, but well worth the investment of time. If an individual has completed the VIA, it is tempting to then go straight to how those character strengths can be applied to what the client would like to achieve from coaching. One might suggest to the client that colleagues or friends pick from the 24 character strengths ones that they notice most. This might form part of a 360 feedback within a team. EXPLORE – At this stage, one can see where the client or team is currently using the strengths. If the client thinks of examples, then one might ask them to think of a time that they were at their best. From there, one can see how the strengths are currently being used. APPLY – How can one or more of the top character strengths be used to either address an issue or move the person closer to their goal? How can a character strength be used in a new way? Character strengths can be overused as well as under used. For example Curiosity can turn into nosiness. Gratitude is one of the most powerful strengths to work with. 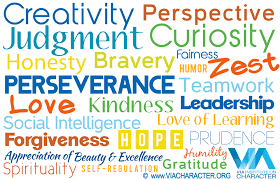 Character strengths most associated with CEOs are love of learning and curiosity. When working with an individual or team, one can blend mindfulness with Character Strengths. You might already encouraging clients to be mindful in their actions and speech. in addition, one can encourage a client to be mindful of which strengths are being used in a given situation. It might be helpful for a client to set their ‘phone to ping say every hour. This serves as a reminder to the client to notice which strength they are using in that particular moment. Over a period of time a pattern will be seen. In addition, it can be really helpful to encourage individuals to spot and appreciate character strengths in others. This might help with conflict resolution or team building. If everybody on a team completed the VIA, then one might discover enough commonalities to establish team strengths. This could be used a tool to develop purpose, meaning and direction for the whole team. This approach might lead to more intrinsic motivation than simply imposing the organisation’s own prescribed set of values. At the same time, the team’s values and strengths can (hopefully) sit comfortably with the company values. Make the goal SMART. Use your prudence strength to plan it out thoroughly across these five elements. Weave in character strengths seamlessly. How will your signature strengths serve as a means to help you achieve your goal? Might other character strengths support you as pathways to your goal as well? Begin to take action towards your goal. How will perseverance support you in overcoming obstacles and staying focused on your goal ahead? Enlist support. Might you include family, friends, colleagues to maintain your goal progress? This could involve deploying your strengths of teamwork, curiosity and love.